The Desktop Laptop Mini USB Speaker is perfect for most desktop computers. It comes with the best black color and the powerful anti-cracking ability, which guarantees that it won't crack even if you turn it to the max volume. 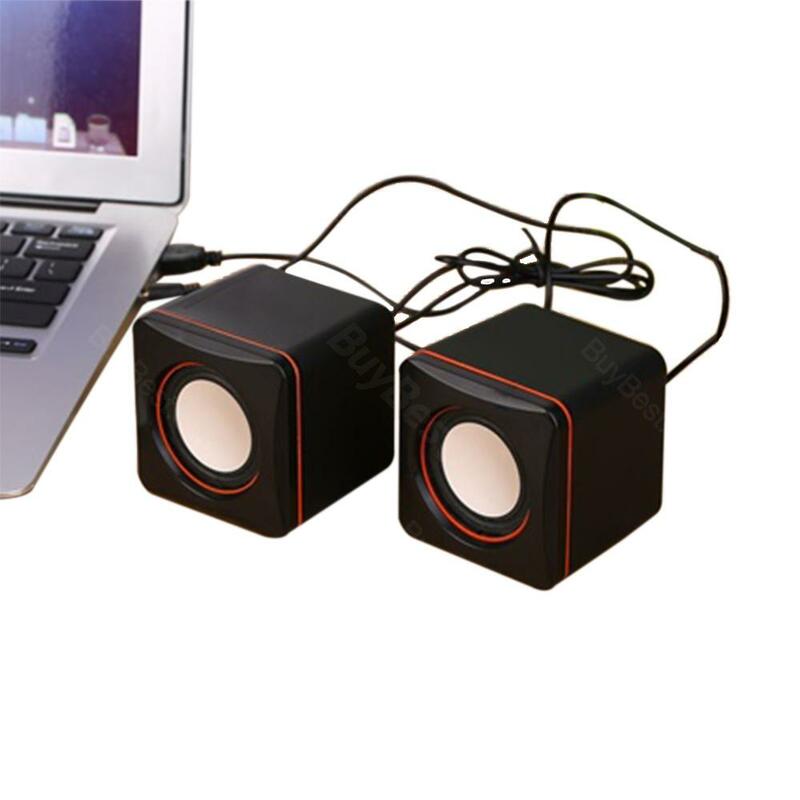 Mini USB Laptop Speakers, 2.0 Channel Wired Speakers for Desktop PC. Small Amplifier. The amplifier is built into the USB speaker and offers powerful sound for your PC, PC, Echo Dot, monitor, smartphone. It has and Control volume is heavily heard for its dimensions it's really a good box at a good price and it's good for clarity I've even been pleasantly surprised how good it can be heard I even ordered a pair of mini speakers A control button on the side from the back of a loudspeaker for high or low volume adjustment very easy to adjust. You can easily adjust the volume with a rotary knob. Their fashionable form. Concise and vogue design makes desktop speakers more compact and smarter. The black color makes it extremely elegant and pleasant. The stylish look fits perfectly on most USB-equipped devices. Easy-to-use 3.5mm and USB interface, a wide range of computers, tablets, mobile phones, MP3 players, etc., without power, you can directly use the USB connection. Best gift An ideal choice for your friends working in the office for children watching home movies. The easy, easy-to-use gesture can take you wherever you want, even on vacation. Thanks BuyBest! Mini USB Laptop Speakers, 2.0 Channel Wired Speakers for Desktop PC. Small Amplifier. The amplifier is built into the USB speaker and offers powerful sound for your PC, PC, Echo Dot, monitor, smartphone. It has and Control volume is heavily heard for its dimensions it's really a good box at a good price and it's good for clarity I've even been pleasantly surprised how good it can be heard I even ordered a pair of mini speakers A control button on the side from the back of a loudspeaker for high or low volume adjustment very easy to adjust. You can easily adjust the volume with a rotary knob. Their fashionable form. Concise and vogue design makes desktop speakers more compact and smarter. The black color makes it extremely elegant and pleasant. The stylish look fits perfectly on most USB-equipped devices. Easy-to-use 3.5mm and USB interface, a wide range of computers, tablets, mobile phones, MP3 players, etc, without power, you can directly use the USB connection. Best gift An ideal choice for your friends working in the office for children watching home movies. The easy, easy-to-use gesture can take you wherever you want, even on vacation. OK, I've had this for 5 hours but LOVE it. The design aesthetics and function are what I'm looking for as an Industrial Designer and it is perfect for my office speaker/alexa needs. I bought an Echo when Amazon allowed some customers to buy them before they were released and have used it daily since and this Sonos blows it away, the sound is incredible! I don't use any Echo apps, I just say "Alexa, play DJ Quick on Spotify", basically just listen to music and occasionally when kids are over ask for jokes...this speaker can do that. Works really well for my laptop. You have to plug it into a power outlet(computer or wall if you have a universal USB wall charger) and you can alter the sound via the computer as well as it's own scroll setting so if you dont want to change it on the computer but it's not loud enough you can just turn the speakers up without effecting the computer. Good device to have laying around when setting up the components on the motherboard. The connections and speaker in general are quite flimsy, but if you are careful it should not be a problem. I did not leave mine in my case, but I thought the sound was rather soft. When my fans started up I had a difficult time hearing the error code beeps. Good looking,small but good wired speakers.